Bust out your waffle makers, friends (alternatively, just make... crepecakes. Not thin enough to be a crepe but not thick enough to be a pancake). I've been making waffles like this for a long time now but I, again, never got around to posting it... until now! This recipe is a wonderful semi-sweet breakfast treat to use as a base for a variety of toppings. Whipped cream. Fresh fruit. Peanut butter. Sugar-free jam or syrup... you get the idea. I usually opt for 1/2 a tablespoon of peanut butter and a tablespoon of sugar-free syrup. When the SO is feeling adventurous he opts for peanut butter, dark chocolate chips, sugar-free syrup, and a sprinkling of cinnamon. This morning breakfast consisted of chocolate egg waffles topped with some sugar-free syrup, accompanied by a side of reduced salt bacon (not because I am against salt. I just prefer my bacon less salty). Oh yeah, and freshly brewed coffee (1 tbsp hwc, 2 tsp of splenda, in a pretty sweet stein), a glass of water, and a multivitamin! I'm glad I decided to go back to early morning breakfasts, because I sure do feel productive today. All told, this special breakfast (everything included) was a little heavy on calories and carbs, but not so much that the rest of my day is ruined. Lunch will be a salad with chicken, and (ended up not eating lunch. drank water instead) tonight we're doing appetizers and a movie Fullmetal Alchemist for at-home date night. NICE. Chocolate egg waffles with two tablespoons of sugar-free syrup and a side of bacon. Preheat and grease your waffle maker. 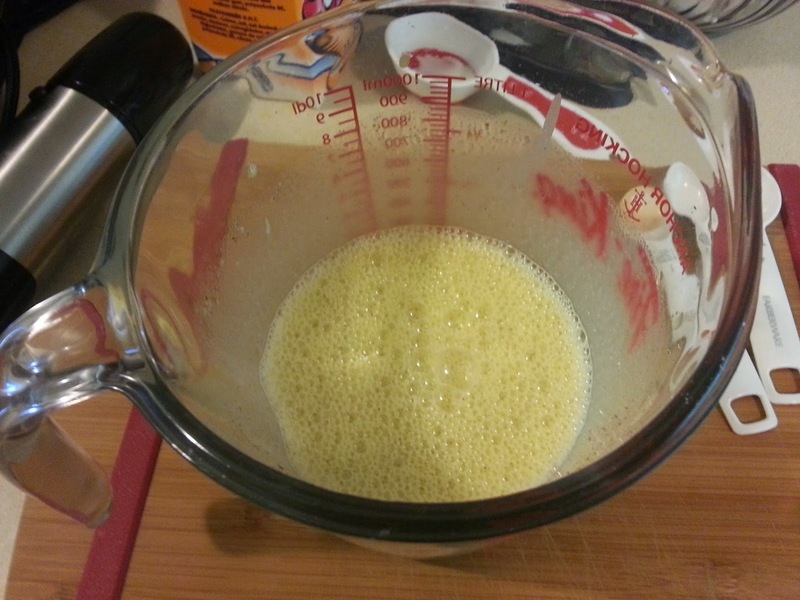 Beat/whisk eggs, cream, sweetener, cocoa/cinnamon until it is all frothy and thoroughly combined. I make my waffles in layers. I do one layer as pictured below and let it cook for a few minutes, then add another layer. Don't let the first layer cook to dry and crisp, you want the next layer to bind to the previous. 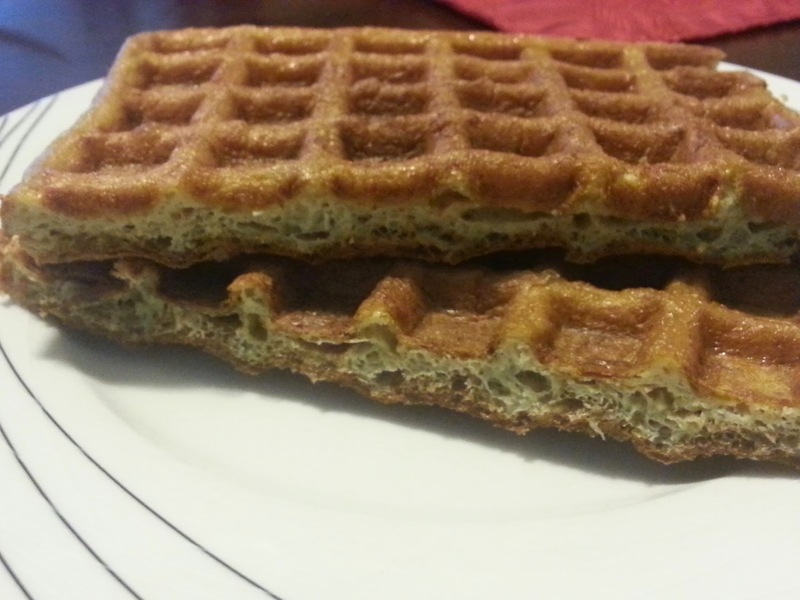 Let your waffle maker cook these up until you are satisfied with them. 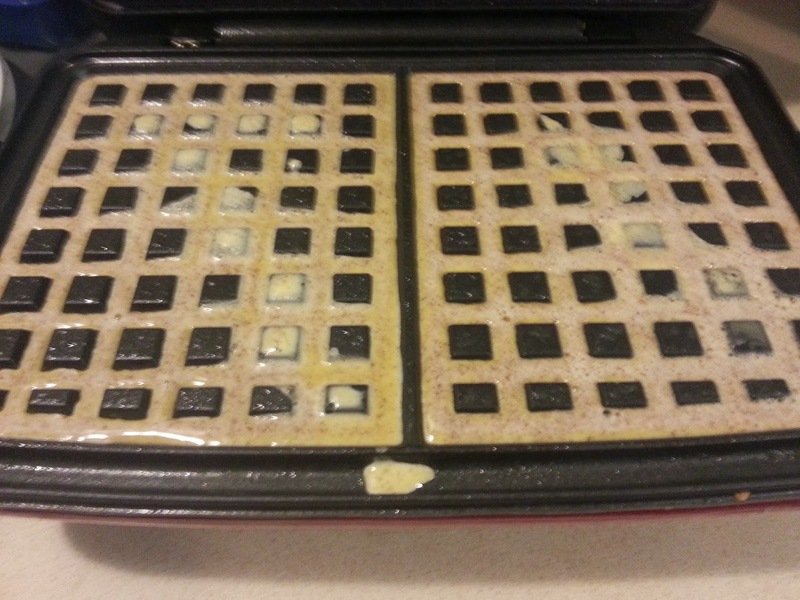 The chocolate egg waffles (pictured at the beginning of the blog) were a little more moist than usual. The waffles pictured below are my preference; firm and crispy on the outside but soft and fluffy on the inside. Get creative with your waffle toppings and enjoy! 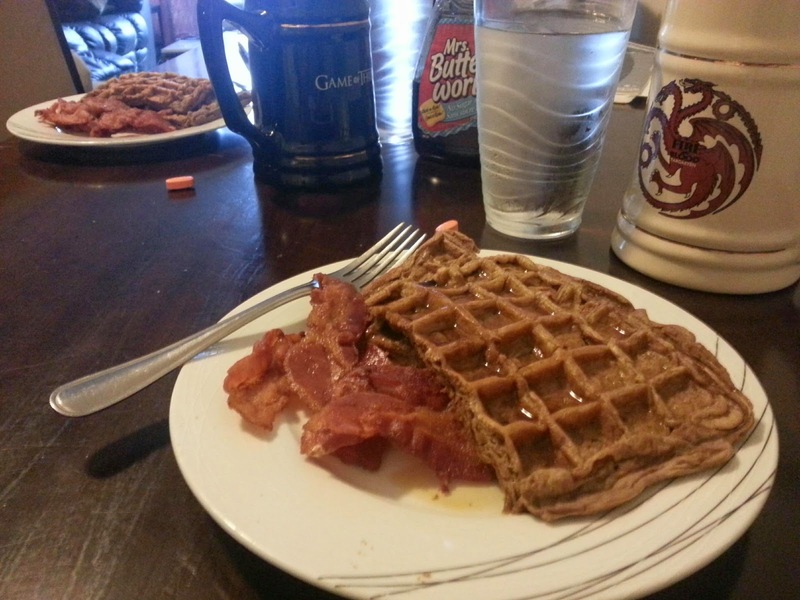 Try rolling bacon, a bit of peanut butter, and a bit of sugar-free syrup in your waffles. YUM! Plain egg waffles. Slightly crispy outside, fluffy and soft inside.